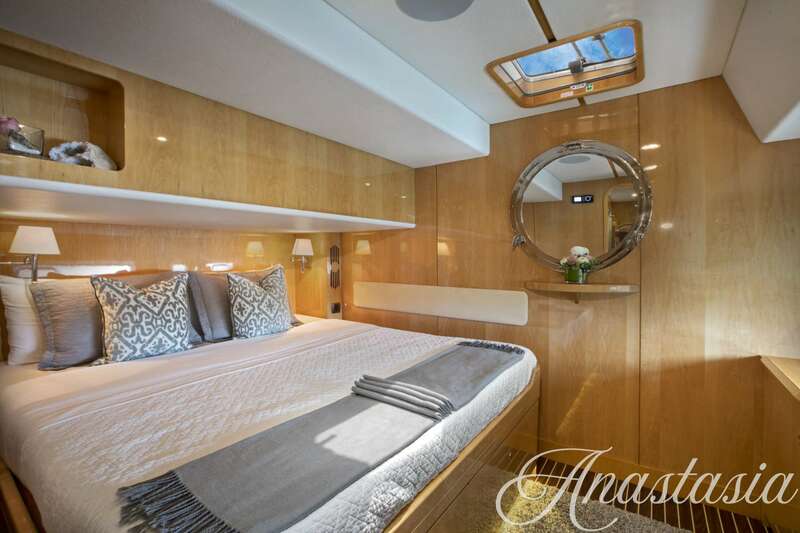 Anastasia has undergone a beautiful refit in 2017 and boasts brand new sails, rigging lines, exterior paint, interior and exterior upholstery, plush bedding and linens, interior decor, countertops, appliances, serving dishes, utensils, courtesy and spreader lights, surround sound system, water toys, snorkeling and scuba gear and a brand new outdoor teak cockpit. 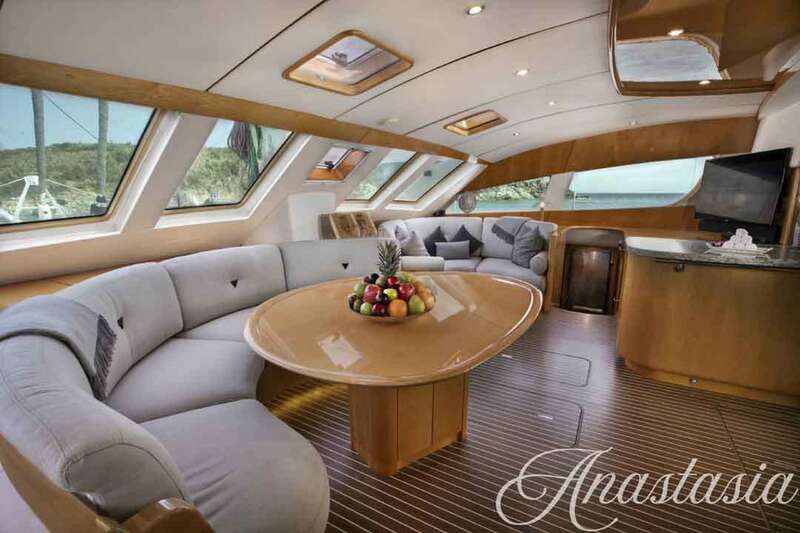 Anastasia has 1 King Owner’s Suite, 2 King Staterooms, and 1 Single cabin to comfortably accommodate a 6-7 person charter. 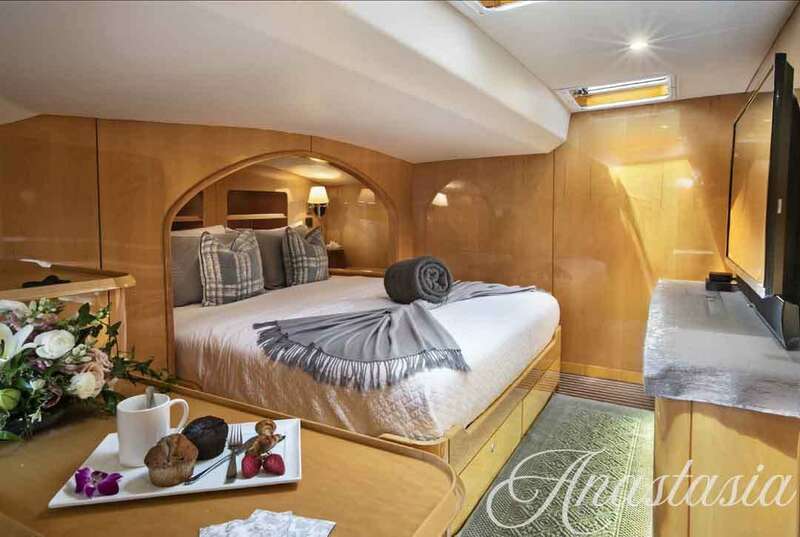 Each cabin suite has its own private electric fresh-water head, a separate spa shower with overhead lighting (including dual shower heads & 6 mini massaging heads), spacious vanity and separate sitting area with individual A/C controls for top of the line luxury and comfort. Guest linens, towels, toiletries and hairdryers are all provided. 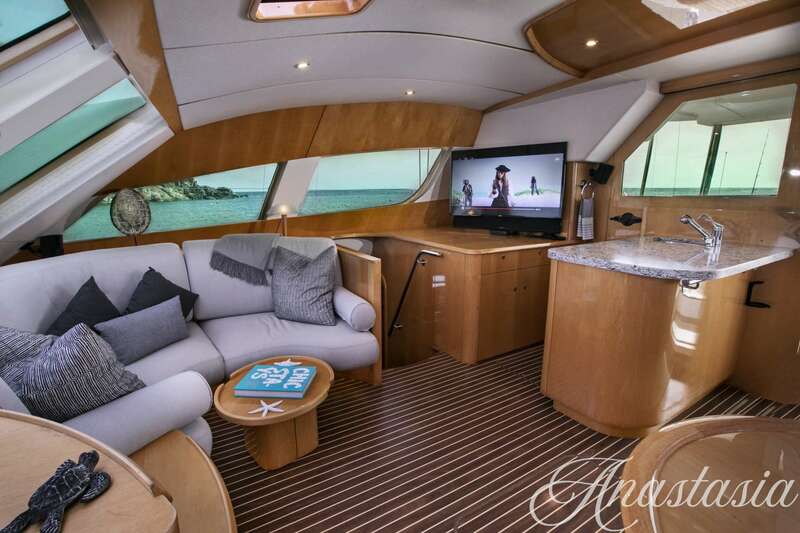 In addition to its spacious air-conditioned cabins, salon and bar interior, there are ample outdoor padded lounge areas with a shaded 360-degree viewing fly bridge, two trampolines accompanied with custom bolster cushions, a double sun bed lounger on the front deck and 2 plush bean bags for your cruising enjoyment. Owner’s Suite: Grand suite with King bed, separate vanity table and work station, private electric ensuite shower with head, body sprays and hand shower, private electric toilet, 50 inch smart TV and 2017 updated sound system with Bluetooth connection, and blackout and privacy shades.